In the 21st century, the question of what it is to be human has become central. Implicit or explicit, anthropology—understood as the exploration of being human—informs our understanding of who we are, how we treat each other, and where we look for, and find, deep healing. On March 28, APOCC  (Analytical Psychology and Orthodox Christianity Consultation) met for its 3rd meeting at Union Theological Seminary, "BEING and BECOMING." It was an extended and in-depth conversation between Jungian and Orthodox Christian communities on anthropology, on the role of the body and the incarnate world in our being, becoming, and relating, and how the depths of our psyches and the heights of transcendence can open us to ever-deeper healing, life, and joy. 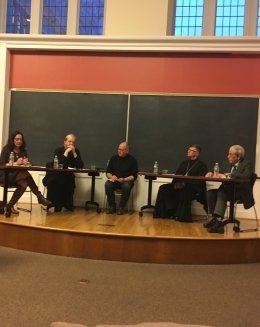 Archpriest John Behr , distinguished professor of Patristics at St. Vladimir’s Seminary, was one of the members of the panel discussions, alongside Dr. Pia Chaudhari, a member of the seminary chapel extended community; Dr. Harry Fogarty, Jungian Analyst and professor at the Jungian Psychoanalytic Association; and SVOTS Alumnus Priest Sean Levine (’10), Chaplain (MAJ), U.S. Army. The discussion was moderated by Michael Monhart, S.T.M., Jungian Psychoanalytic Association and APOCC co-chair. Several other seminarians and members of the SVOTS community attended the meeting. The event was co-sponsored by the Institute for Studies of Eastern Christianity  at Union Theological Seminary, the Jungian Psychoanalytic Association , and the Fordham University Orthodox Christian Studies Center . “I do hope the conversations can continue,” he added. “There is much of common concern to all of us." APOCC was co-founded in 2016 by Priest Adrian Budica, St. Vladimir’s Seminary’s director of Field Education and CPE supervisor, and Dr. Pia Chaudhari upon meeting at St Vladimir's Seminary Chapel and finding a common interest in the dialogue between Orthodox Theology and the Jungian theory of personality. SVOTS alumnus Fr. Sean Levine and Michael Monhart became co-chairs in 2017. APOCC's first meeting in 2017  was also well attended by SVOTS faculty members, students, and community members. APOCC remains in dialogue with those interested via its webpage  and mailing list.